On Feb 11 a light sheening remained at the sinking site of the "Ed McLaughlin" near the village of Cheshire which lead the US Coast Guard to believe there could be some kind of discharge, but just what the discharge is or the discharge rate was unknown. Part of this was due to the water conditions with rising water level and strong currents making it difficult for investigators and responders at the scene. Besides monitoring the situation, there wasn’t anything that could be done until the current has slowed down. The Coast Guard was on scene monitoring the situation, also had a mitigation team on standby to mitigate any risk of fuel leakage. What caused this incident remained under investigation. The "Ed McLaughlin", 83 gt, sank near Cheshire, Ohio, on Feb 8, 2019. 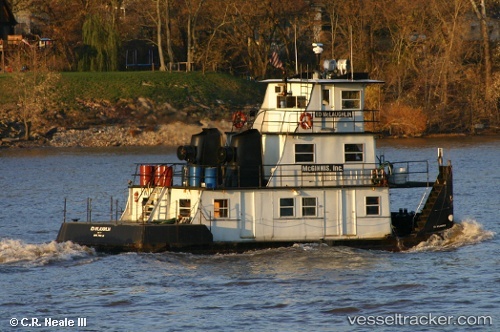 The Coast Guard Marine Safety Unit Huntington received a report at 1 p.m. that the tug of the McGinnis Marine had capsized on the Ohio River at mile marker 259. All three crewmembers were accounted for and have been taken to a local hospital. They were reported to be in stable condition. There was an estimated 4,900 gallons of diesel fuel on board. Light sheening was reported to be around the vessel. Members from MSU Huntington were en route to the scene to determine if the vessel was leaking fuel and to provide initial assessments of potential environmental and waterway impacts. The cause of the incident is under investigation.